Merret's Map of 1834 below shows the initial layout of the Gas Works occupied the area to the South of the Coach Road (later known as Mill Street) and north of the area later referred to as Gas Green, Alstone Terrace and Soho Place. Access was at first from Tewkesbury Road and there were several coal wharves in the area.The Gas Company was first established as a Joint-Stock Company in 1818 by Act of Parliament. A meeting of the Town Commissioners on February 18th, 1818 was held for the purpose of receiving proposals for lighting the town with gas, but despite some opposition to gas lighting, namely fear of explosions, those responsible for the Gas Works were able to allay any fears. Pipes were laid between 300 ft. and work completed within about six weeks and the main street was first lighted by gas on September 29th 1818. By October, the shareholders of the Company were gratified on the 29th at seeing the whole High Street illuminated by this beautiful light which assumed its usual brilliancy towards midnight when the atmospheric air had escaped from the main pipes. By December 11th, it was ordered that Mr. Newmarch do get the railway in the Gas Yard completed as soon as possible, as by this time, everyone wanted their buildings lit by gas though some were reluctant to meet the cost. On 20th January 1822 a Mr. Thomas Spinney was appointed Clerk and Engineer at �250 per annum and he moved into Ragley Cottage - a house rented by the Company at or near the works. Probably the house marked on the 1820 map as fronting the road, within the works area. So successful was this venture, it became imperative to enlarge the site and the supply of coal needed also to be increased. Originally coal was obtained from the Forest of Dean, but later Derby and Staffordshire coal was brought from the midlands and once the railway was built, the transportation of coal was much easier. However, expansion and the need for more coal to be brought right into the site itself meant that a sidings from the main line needed to be taken right into the heart of the Works. Accordingly, by the mid 19th century the Company applied for such extension which would mean the demolition of several cottages on the coach road as well as Gas Green and Alstone Terrace. The Old Town survey of the 1850's shows Alstone Terrace on the bottom left and the cottages on the old Coach Road, and Gas Green School due for demolition. Understandably the home owners were appalled at the prospect of losing their homes, poor though they may have been. So a petition was presented to the House of Commons in 1872 humbly petitioning that the proposal by the Gas Company to make a short cutting or tramway between their works and the Midland Railway and stopping up Alstone Terrace Road for this purpose, be not allowed. They pointed out that the road was a public highway and was the nearest and principal approach to the property in and on the south-west side of the coach road from the Knapp and the centre of the town. They also stressed that the road was constantly and frequently used by the petitioners in going to and from the houses, market gardens and land adjoining the coach road and that the stopping-up of the said road would be very detrimental and injurious to them and their properties. It was also expected that with the erection of the new Midland Goods Station, it was believed that the property between the said station and the coach road would be rapidly developed and would thus devalue their properties. Just over forty local residents from the area which included not just the coach road, Alstone Terrace, and Albion Gardens but Tewkesbury Road, Bloomsbury Street and Moor Gardens, signed the petition. Sadly, as so often happens protests of those affected by change were ignored and one by one the cottages in the coach road disappeared as did the whole of Alstone Terrace and Gas Green and the site gave way to extension of the railways and processing sheds and the whole site extended to Gloucester Road between Tewkesbury Road and Mill Lane which ran alongside the Chelt. An aerial map of the Gas Works c. 1926 shows Gloucester Road to the right facing the site of Gloucester Rd. School and the Old Farm which was adjacent to Mill Lane. 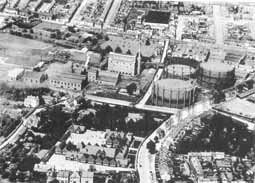 By that date the Gas Works had extended from its original site to Gloucester Rd. itself, sweeping away all of Gas Green. Alstone Terrace and many of the cottages on the old Coach Road. However, with the advent of electricity which people began to prefer as much cleaner, and also the Clean Air Acts, the consumption of gas declined and by the 1970's demolition had begun. The site was re-developed for a multi-million pound Superstore - Tesco, and was scheduled to cover over 61,025 square feet. It finally opened in 1990 and the grand opening was marked by the gift of flowers and champagne to the first customers, by the Store's General Manager, Mr. Richard Fabian. Since then the store has gone from strength to strength and is due to expand still further.